On January 4, 2016 His Holiness Pope Francis has elevated the Syro-Malankara Catholic Apostolic Exarchate in the USA to the status of an Eparchy and has included the territory of Canada to the new Eparchy. The Holy Father appointed His Excellency Most Rev. Dr. Thomas Mar Eusebius as the first bishop of the Eparchy. The new Eparchy is called St. Mary, Queen of Peace Syro-Malankara Catholic Eparchy in USA and Canada. This news was announced concurrently at the Vatican, Syro-Malankara Major Archiepiscopal Curia in Trivandrum, India and at the St. Vincent De Paul Syro-Malankara Catholic Cathedral in Elmont, New York which will be the seat of the Eparchy. It was on July 14, 2010 that His Holiness Benedict XVI established the Syro-Malankara Catholic Apostolic Exarchate in the USA and the official inauguration of the Exarchate was conducted on October 3, 2010. Since then the Church has expanded in terms of worship locations, establishment of new parishes and missions, and the number of faithful grew in both countries. The highlight of the rapid growth was the establishment of the Cathedral and Chancery which serves the focal point of the pastoral leadership, and home for its seminarians and newly ordained Syro-Malankara Catholic priest. During the brief solemn program conducted earlier today, in conjunction with the official announcement, His Excellency offered intercessory prayers to Mother Mary, Church’s Heavenly Patroness. The Bishop was joined by the Vicar General Rev. Msgr. Peter Kochery, Chancellor Very Rev. 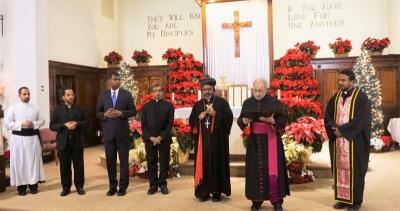 Augustine Mangalath, Pastoral Council Secretary John P. Varghese, Malankara Clergy, Sisters and faithful. Rev. Msgr. Peter Kochery read the official text of the communication from the Holy See which was applauded by the faithful who were present. The nominated Bishop, Most Rev. Thomas Mar Eusebius Naickamparambil gave a brief remark afterwards and expressed his heartfelt gratitude to the Holy Father and His Beatitude Moran Mor Baselios Cardinal Cleemis for their care and support in establishing the first Syro-Malankara Catholic Eparchy outside of India. His Beatitude Moran Mor Baselios Cardinal Cleemis Major Archbishop-Catholicos, His Eminence Timothy Cardinal Dolan of New York Archdiocese, His Grace Most Rev. Thomas Mar Koorilos of Thiruvalla, India Archieparchy, Most Rev. William Murphy of Rockville Center Diocese and many other ecclesiastical dignitaries from USA, Canada and India are expected to attend.